PARIS (KFSM) - Hiring a first time head coach has its risks and rewards. But Paris is excited about Tyler Clark, who's coached at some of the top programs in Arkansas. "It's really exciting," Clark said. "We've had a really good transition here, the kids have done an outstanding job with the amount of effort they've put forth trying to learn a new offense because change is hard on people. I've been really impressed with the kids." "It's been really tough learning," junior Blaise Woods said. "But now that we have it down, we're getting little victories out of it until we fully get it down." Clark played at Russellville and was a volunteer with the Cyclones for three seasons before taking a position as Warren's offensive line coach for two years and held the same position with Marion for two more years. "What excites me the most is that our kids give the max effort all the time," said Clark. "I think there's a chance for some special things to happen when kids are just going max effort all the time." "Honestly at first it was tough," senior Ben Haddock said. "But now it's getting better. We had some tough times but I like the offense a lot better now." 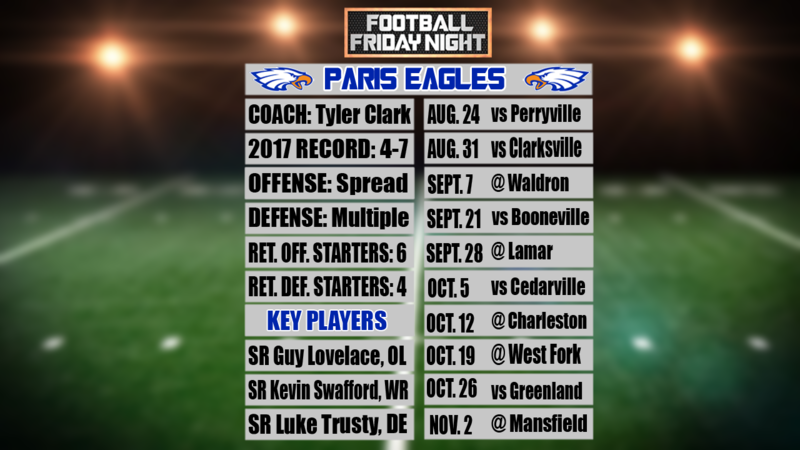 Paris opens the season by hosting Perryville and Clarksville in weeks zero and one.